We are happy to share with you the first edition of the Smart Mature Resilience newsletter. This newsletter will be circulated quarterly with the latest project results, updates on project activities in cities and the latest news on critical infrastructure protection and city resilience. SMR is a 3-year EU-funded interdisciplinary research project working for more resilient cities in Europe. Researchers and cities come together to enhance cities’ capacity to resist, absorb and recover from the hazardous effects of climate change. For more information on the project’s goals, methods and partners, please visit www.smr-project.eu. 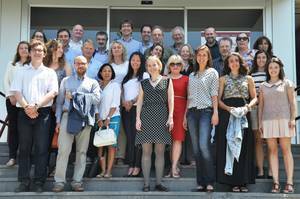 The Smart Mature Resilience project officially launched on 22 June 2015 at the project kickoff meeting, which was held in Donostia, Spain and hosted by the project’s coordinating institution, Tecnun. The SMR consortium will co-create, pilot and use the tools developed to assess, plan and enhance cities' resilience. These cities will co-create, pilot and use the tools developed to assess, plan and enhance their resilience. Vejle's resilience strategy, developed by the city's Chief Resilience Officer, Jonas Koustrup, will be presented to the City Council for approval next month and launched on March 17, 2016, at the Munkebjerg Hotel. This will be attended by national local and national politicians, international city representatives, 100 Resilient Cities representatives and Vejle stakeholders. During the week of the launch, a “Resilience Festival” will be held with a programme of resilience-related activities and events. Project partners will meet in Kristiansand on 15 February for the first in a series of workshops in project cities to prepare for tools testing. Each workshop is set to take a specific thematic focus in the field of critical infrastructure. The Kristiansand workshop will focus on the topic of water and sewage. Partners met in Bristol from 25-28 January 2016 for a workshop on the topic of climate change. This was the second in a series of workshops for core project cities and their stakeholders to gather and analyse cities’ resilience needs. 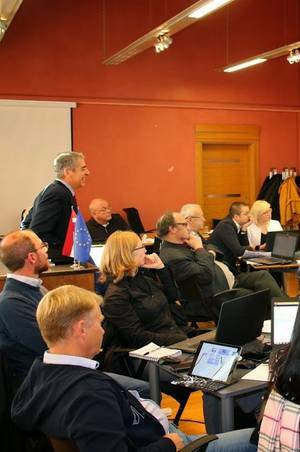 The first workshop was held in Riga from 26-29 October 2015 on critical infrastructures. It focused on the identification of milestones and obstacles for resilience building and the indicators and variables to be identified to measure a city's level of resilience. The workshop made use of the project's broad geographical reach to explore the regional differences in critical infrastructure risks to be considered as part of resilience building and to analyse the organisational structures that are most crucially positioned to handle risks. The series will continue in Rome from 22-25 February with a session focusing on social resilience. Project partners are currently planning the development of a communication platform that will facilitate different levels of communication and engagement as a shared resource in the project. The City of Kristiansand will present SMR material as part of a local workshop. The city of Donostia will present on SMR at the Donostia/San Sebastián City Congress. CIEM partners will represent SMR as part of the 12th International Conference on Web Information Systems and Technologies. ICLEI Europe will represent SMR as part of the 8th European Conference on Sustainable Cities and Towns. Project partners will give a presentation on the topic of "Co-creating climate adaptation and resilience building support tools with cities" at the International Climate Change Adaptation Conference. In cooperation with the European Commission and the Government of the Netherlands, ICLEI Europe is also organizing a high-level round table on “Nature-based solutions in cities” during which good examples and lessons learned on how to enhance cities’ resilience through nature-based solutions will be explored. The EEA and ICLEI Europe will organize the 3rd Open European Day (OED), taking place on the 5th July, back-to-back with the Bonn Resilient Cities Conference. The Annual Global Forum on Urban Resilience and Adaptation is the global platform for urban resilience and climate change adaptation, hosted every year in Bonn with more than 500 participants and over 30 partners annually.